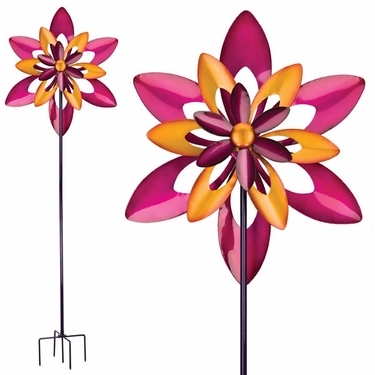 Bring HUGE color and motion into your kinetic garden with the help of our newest 32" Large Metal Starflower Wind Spinner! This handcrafted metal spinner standing 80" tall has been reinforced with a high quality and durability design. Stainless-steel bearings with super strong iron bearing casing to keep thick blades attached, large durable ball bearings for the best spinning action, extra thick and strong pole and ground stakes!